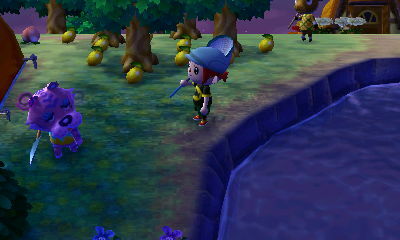 Just like a good chunk of the video gaming community, I’ve immersed myself in Animal Crossing: New Leaf (ACNL). I really didn’t know what to expect since this is my first AC game. I pretty much got it due to the fact that many of my friends were playing it too. 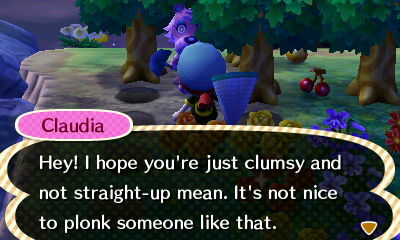 ^^ It turns out New Leaf is pretty fun! The biggest surprise I got from it is that I learned that it requires a long-term commitment. 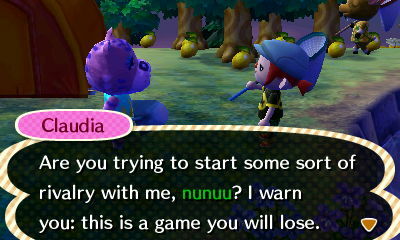 I mean, sure, I can probably just not bother playing the game for a few days or months but that would mean that my town would turn into some desolate, weed-infested junk land where no one would want to live in. 😦 Heck, even I wouldn’t want to return to it then. 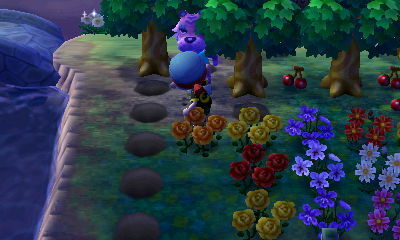 At that point in time, I probably wouldn’t even bother playing ACNL ever again. Now, about my friends’ towns, most of them have female sheep or penguin residents! I only have one male sheep. 😦 I want penguins because they’re adorable! *__* I just got my 10th resident today so in order to get a cute animal to move in, I’ll have to get rid of one or two first. 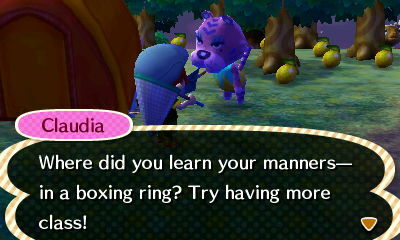 So now, I’ve embarked on a mission to try and force Claudia (who’s a tiger, I think) out of my town. I went to her house twice because she invited me over and twice I’ve told her that it’s great. For some reason, she takes this as an offense; like I’m just saying it to make her feel better! The next day, I would get a note from her that starts off with the remark that I am harsh! WTF? I do like her home! So tonight, I started smacking her with a net as well as cornering her to constantly pushing her into a tree. I just want you to leave, dammit. I was watering her for a bit but I think it didn’t actually reach her. I kept walking into her and then eventually went back to hitting her with a net. I’ve also send her a letter telling her to go away and attached a pitfall seed to it. I plan on keeping with the abuse for as long as I can to see if she really will leave.